Dried banana chips are deep-fried slices of bananas of the soft, sweet “dessert banana” variety. They can be covered with honey and have a sweet taste. 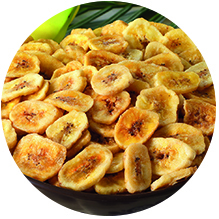 Dried banana chips contain mostly all vitamins and minerals found in fresh banana fruits. Banana chips are widely used by the confectionery, baking, and health food Industries. They can be easily mixed with various types of nuts and be eaten as a snack.